Dubai: Dubai on Sunday launched its most “disruptive innovation” in education — the Rahhal programme allowing students to study at more than one school at a time, study part-time to pursue other goals elsewhere, or study at home. A pilot phase of Rahhal, which means traveller in Arabic, began at Indian High School (IHS) in Oud Metha, with three parents and IHS signing “Rahhal-enabled” contracts at the launch ceremony. At IHS, the pilot phase of Rahhal will allow two of the students, who are sports champions, extended time off school to train for and compete in prestigious tournaments, without fear of losing out on studies. A third student will take leave to pursue specialised training in technology, including in artificial intelligence. Under Rahhal, the school will fully support all students to catch up on missed studies, by dedicating teachers and classes for them. Rahhal is “not a one-size-fits-all” framework as each Rahhal student journey will be different, customised to his or her needs, officials said. In the near future, with participation from more schools, there will be a variety of scenarios. Clifford Crasto, father of grade 10 student Tanisha Crasto, said Rahhal was a main reason why the family decided to stay on in the UAE. Tanisha is a badminton champion who ranks “number one” in the UAE and plans to win Olympic gold one day. She currently trains for over six hours daily, “making it a little difficult to manage studies. But now with Rahhal, I’ll be able to focus more on badminton and equally on studies”. Rahhal is the first pilot project to be launched under Dubai 10X, a Dubai Future Foundation initiative that aims to place Dubai government entities 10 years ahead of the rest of the world in key sectors, by implementing within two years what other cities around the world will be implementing 10 years from now. 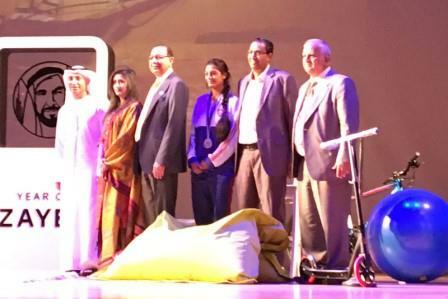 Rahhal was launched by the Knowledge and Human Development Authority (KHDA) in Dubai, as part of 10X. Dr Abdulla Al Karam, director-general of KHDA, said: “We are taking a big leap away from the traditional model of education and experiencing the future of learning." Khalfan Juma Belhoul, CEO of Dubai Future Foundation, said: “Dubai 10X is one of the projects launched by Dubai Future Foundation that aspires to position Dubai 10 years ahead by disrupting key sectors like education, aviation and many others. Learners participating in Rahhal will be recognised by KHDA and also work closely with teachers at their school to ensure maximum learning. Rahhal, meaning traveller in Arabic, is an initiative of the Knowledge and Human Development Authority (KHDA) in Dubai, under Dubai 10X. It allows students to study at more than one school at a time, study part-time to pursue other goals elsewhere, or study at home. The flexible nature of Rahhal means that each student journey will be different, according to his or her needs, as agreed between schools and parents. For example, a student of one school will be free to study some subjects at another school, or go abroad for specialised courses. Parents and schools will work out the costs and logistics between themselves.